Joseph Bucklin’s biography; business, society, family connections in 18th century Rhode Island. JOSEPH BUCKLIN (JOSEPH, JOSEPH, JOSEPH, WILLIAM) was born 20 February 1719/20 in Coventry, Kent, Rhode Island and Providence Plantations. He married Zereriah Sabin 29 September 1751. Joseph Bucklin IV was a typical leader of the American Revolution, and is interesting in that regard. But, first, you may want to know that, in 1772, when Joseph Bucklin IV was 52 years old, his son (Joseph Bucklin V) shot the English ship captain in Rhode Island’s capture and burning of the English ship Gaspee. That shot was declared in England as the first act of war by the American colonists, and is noted by English historians as the first deliberate military engagement of the Revolution. King George III proclaimed a reward of 1000£, and ordered that the traitor should be would be brought to England for trial. The family of Joseph Bucklin obviously had reasons for hoping that the American Revolution did not end in failure, with the instigators of the Revolution being hanged as traitors. From that point in 1772, a dozen or more Bucklins became active in revolutionary activities. Joseph 4th was a merchant in the area of Providence, Rhode Island. From 1759, until his death in 1790, he shows up on lists of occupants of Providence buildings, as a landowner having houses, wharfs, barns, and shops. .He operated ships both as an owner and also as his own ship captain (from which his title of “Captain” comes). The ships that Joseph captained were only a part of his business enterprises. Joseph 4th had a blockmaker’s shop and ship repair business on his property, together with a wharf, warehouse and store, and another wharf and warehouse elsewhere in Providence. Joseph was neither the block maker nor the shopkeeper; nor always the sole owner of the ships Joseph was the importing goods, nor always the ship master sailing the ship. Joseph was the financial and managerial director of operations. It is significant that Joseph IV gave his title in his post-revolutionary will as “Merchant”, instead of the more aristocratic title of Captain or Esquire, which were titles used by others of his social rank. A merchant was someone who made their money by an overseas wholesale importation or exportation of good, someone who was important to his colony not for reasons of social rank but rather for economic value to the colony. or reasons to or from the colony. Gentleman and Yeoman were titles that indicated a person of importance who preferred that others think of him as a person of wealth and status, not as someone who worked because of need to earn a living. [Wood 1991]. Providence of Captain Bucklin’s period had a flourishing maritime trade, a merchant aristocracy, a few industries, a body of skilled artisans, a newspaper, a stagecoach line, and several public buildings. Fortunes of many of the merchants and ship owners had been built on the export of lumber, fish and rum, and the importation of tea and sugar and molasses, and slaves. Whaling was the basis of a thriving candle factory. Tea, sugar, sugar, molasses and rum were examples of items which the English tried to tax and the Providence merchants preferred to import without paying the tax. Joseph was one of those merchants. Joseph Bucklin 4th started using ships to gather and trade merchandise at least by 1760, when he rented a sloop from Esek Hopkins. Joseph’s account book and other papers in the manuscript department holdings of the Rhode Island Historical Society suggest that he was at least moderately successful in using one ship at a time to increase his capital. These sailing ventures expanded to include a blockmaker’s shop and sales of materials for the repair or outfitting of ships. 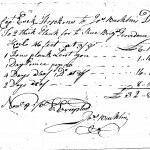 In November of the same year of 1760, Esek Hopkins was paying Joseph Bucklin for planking for the keel of the brigantine Providence and for wages for skilled labor (black Prince Bucklin) in connection with the repairs. 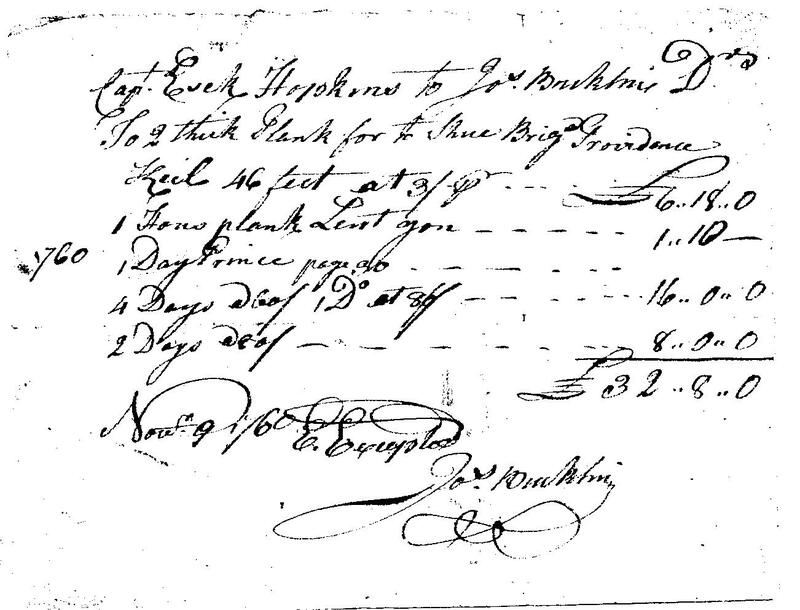 (The signature at the top of this page is taken from his bill to Hopkins for the lumber and labor. The brigantine Providence has a history that involves Joseph Bucklin, It was commissioned in 1757 by Stephen Hopkins, then governor of Rhode Island, as a privateer to seize goods of France. Esek Hopkins was the captain of the privateer ship. After the Seven Years War, the brigantine Providence continued in use. In 1768 it was partly owned by Joseph Bucklin the 4th, together with Nicholas Cooke and Benjamin Cushing. In 1768 he served as his own master of the brigantine Providence when it was confiscated for being involved in smuggling. Joseph sued to recover the ship and the rum seized as contraband. He won the case, and costs were assessed against the customs collector. Thus, Captain Bucklin himself had been accused of smuggling of rum, and was probably well acquainted with the famous four merchant Brown brothers of Providence, including John Brown, the leader of the Gaspee attack. 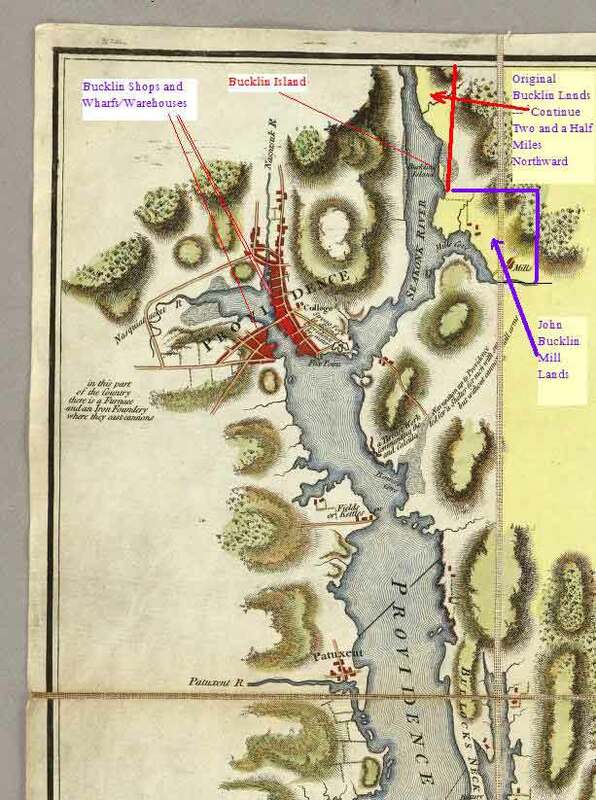 Click here to go to various accounts of the Gaspee Affair. Bucklins were prominent in the Providence/Pawtucket area. The fact that in 1761 Joseph Bucklin petitioned the legislature to get the streets of Providence paved, and was appointed, together with John Brown, as one of the directors of the Providence Street Paving Lottery suggests he was a prosperous merchant by that time. Joseph Bucklin 4th participated in advisory capacities in public committees involved n the Revolutionary War. He was involved with work in the fortification of Fort Independence, guarding the port of Providence. Joseph 4th was a member of the Rhode Island’s legislatures “Committee of Correspondence” that was organized to coordinate the resistance of the colonies to England. Joseph 4th was also one of the committee formed by Providence to see to the enforcement of the ideas of the First Continental Congress. These were important committees, on which were the important men of the day. 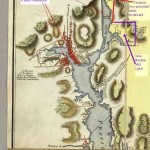 The Bucklins of 1772 owned a large portion of the land across the Sekonk River from Providence. (Click on the thumbnail map to get an idea of the large size of the Bucklin holdings compared to the town of Providence.) Indeed if one crossed the river going from Providence going to Boston, it was impossible not to be on Bucklin family land. The Bucklins were always involved in civic affairs of the Pawtucket area adjacent to Providence. Hence, Joseph Bucklin was of a “proper” family entitled to respect. Yet, one does not see accounts of social interactions between the Brown family and Bucklin family. A clue may lie in the fact that Joseph Bucklin 4th had one of the earliest and best lots on the west side of the Providence River, when the compact part of Providence was expanded west of the Market Square and across the river. This new portion of Providence, with its new street of “Westminster Street” was not clearly under the social rule of the Brown brothers and those associated with them. Here are more facts about Joseph BUCKLIN, 4th, Capt. JOSEPH1 BUCKLIN, 4TH, CAPT. was born 20 Feb 1719/20 in Coventry, Kent, RI1,2, and died 27 Dec 1790 in Providence, RI3,4. CAPT. JOSEPH BUCKLIN, 4TH, was the fourth in an unbroken line in Rhode Island of Joseph Bucklins, starting with the son of William Bucklin, the 1630 colonist from England that moved to Rhode Island in 1645. Joseph Bucklin is shown on the 1759 list of those who had property at risk of fire in the compact part of Providence. There had been a serious fire the year before and many buildings were destroyed. The 1759 assessments for fire protection were based on the value of the property in the area considered to be at most risk of fire because of the “compact” nature of that part of Providence..
Joseph Bucklin was assessed 20 pounds, which placed him in the upper 25% of persons according to amounts assessed for buildings in the town. The assessors did not include in his assessment anything for the next door building of Bucklin and Donnison which the assessors described as “House &c 4.th[sic] order with a Wharf Lot” . That building was assessed to Donnison. Joseph was assessed for the house and buildings described as being the third lot from the river, beginning at the bridge, on the West side of the river, on the North side of Westminster Street. [Chase Papers, box 1, f. 21] (the Bucklin and Donnison joint building was the second from the bridge) Joseph and Donnison also had a building of some sort southerly, near Fields point, but it was not assessed, which suggests it was not in the “compact:” part of the town. This was the area preferred for the easy unloading of ships, which suggests a warehouse as the building of Joseph there. The nature of Joseph being both a ship captain and also a merchant is illustrated by his designation as “mariner” but still being taxed for ” a house, store, block making shop & wharf, all good and complete, and a stable” at the “N. Sd. Market” [Chace Papers, box 1, f. 18]. [See also Kinsley Cooper’s remarkable 1771 inventory of the houses of Providence. ], plus a second wharf and house on the waterfront at South Main street. The census of Rhode Island in 1774 shows Joseph 4th heading a household in Providence consisting of three males above the age 16 (himself, his son Joseph 5th, and one other male), two females above the age 16 (his wife and daughter Nancy), one female under the age 16 (his daughter Sally), and three blacks. The additional white male and three blacks is consistent with Joseph doing a good merchandise and/or ship repair business in the town of Providence. This was an entry in Joseph’s family bible, an entry made by the only member of his family who survived him. Because of Joseph clear prominence as a merchant, consistently being referred to with the title “Capt.” in news articles because of his merchant ship adventures, there is one published item about Joseph Bucklin 4th that does not make sense to us. That is the 1861 statement of Bartlett, in his history of the destruction of the Gaspee. As Secretary of State of Rhode Island, Bartlett had access to the official documents, and added his own observations in a privately printed edition of 125 copies of the documents. In a footnote at p. 20 with no source given, Bartlett describes who Joseph Bucklin was. Bartlett does not in any way refer to Bucklin’s occupation as merchant captain and merchant. Bartlett said of Joseph’s occupation: “Joseph Bucklin . . . .kept a prominent restaurant, or place of resort, in South Main Street, where gentlemen resorted for their suppers”; and Bartlett went on to say the Bucklin “restaurant” was near Sabin’s tavern. From thence have come all later statements that it was Joseph Bucklin 4th that was the shooter, and that he was an innkeeper. From the evidence presented, we do not think Joseph Bucklin 4th was a restaurant owner. Bartlett was not born in time to be either a participant or witness to 18th century events. A young Bartlett’s only advantage as a fact gatherer was that he had some social conversations with an elderly Bowen before Bowen died in 1840. Joseph Bucklin 4th in 1772 would not have been known as an restaurant owner or innkeeper. He was known as “Capt.” and for his substantial merchant and shipping interests. There is absolutely no doubt that Capt. Bucklin made his substantial money from the ship/merchant business, and participated in town events on that basis. Joseph Bucklin 4th does not show up on the tax lists for 1770 as having any tavern property but rather as having wharfs and shops. The only known property of Joseph that was on South Main Street was a building and wharf owned by the mercantile partnership of Bucklin and Donnison. The building was not near Sabins’ tavern, but rather near Fields point. Fields point was the area preferred for the easy unloading of ships, which suggests a warehouse as the building. It is possible that after Joseph’s first wife died in 1776, and before Joseph remarried, Joseph as a businessman of means found it convenient to open a place where he and other unmarried men could have a supper, and that post 1776 item formed the basis for a story that Bartlett turned into a fact of for 1772. Alternative, and just as speculatively, the fact that Joseph’s first wife was a Sabin (although she was not from the tavern keeping Sabin families) caused confusion when Bartlett was talking to the “old-timers” and gathered his information. Alternatively, and more likely to us, Bartlett simply was wrong, in his undocumented assertion that Joseph Bucklin 4th was an innkeeper.